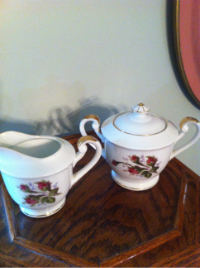 This is a lovely and excellent condition creamer and covered sugar bowl marked Made In Japan Thames china. It appears to be a vintage china and the pieces are about 6" tall. See my other pieces of Thames. You are getting both the cream and sugar for the amount here.